This question got my brain spinning. One of these students uses eye-gaze for communication, and the other one is still a mystery about his best communication method (eye gaze, switch scanning, other). 2. I attended a free PRC language lab webinar and was completely smitten by the digital books. I realized how many of my kids who are not interested in paper books (or who rip them to shreds) could be motivated by the same book on an iPad. I did a bit of toying around and presto! 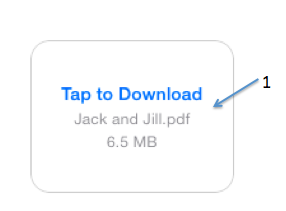 It turns out it is really easy to save a pdf book onto iBooks and have it easily accessible with you at all times! 3. 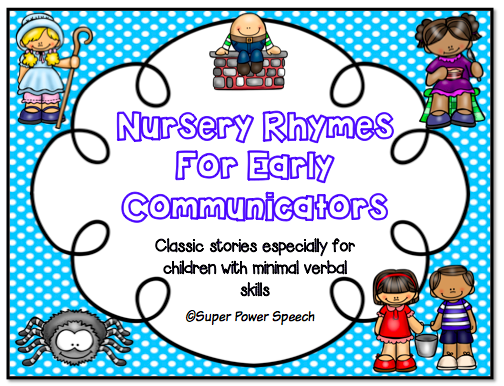 Although I was in the beginning stage of making a large set of adaptable books, I got sidetracked when Educlips released their new Nursery Rhymes art. I knew that these would be the perfect short books to use to introduce my students to AAC story comprehension! Why save a pdf story onto the iPad? It is so engaging for students to see a light up screen. Even babies are drawn to that glowing magic! The adult can hold it easily so that the student doesn’t rip, tear, throw, or eat it. 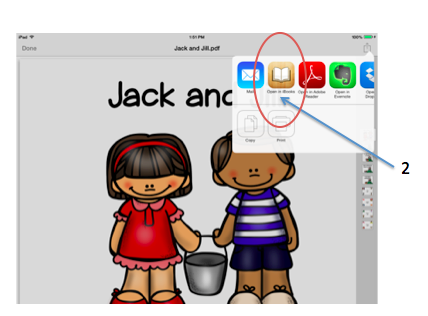 Students with limited motor skills may still be able to swipe the screen to turn the page. It is with you everywhere that you take your iPad! No more searching through file cabinets for the book! How do I safe a pdf story onto the iPad? It turns out that it really isn’t that hard to do! 1. Email the file to yourself (you can also use Dropbox). 2. Tap on the book after it loads and then tap on “Open in iBooks” (make sure you have iBooks downloaded!). 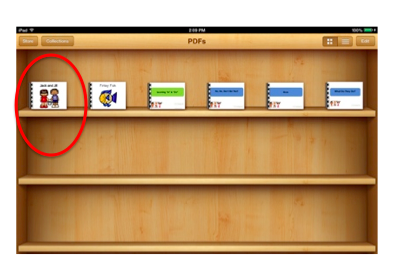 If you cannot find the “Open in iBooks”, try tapping on the little page symbol with an arrow. That worked on one of the iPads that I tried. 3. Now the book is saved in your iBooks library! You can save many, many books in there for super easy access! How can I use picture scenes? 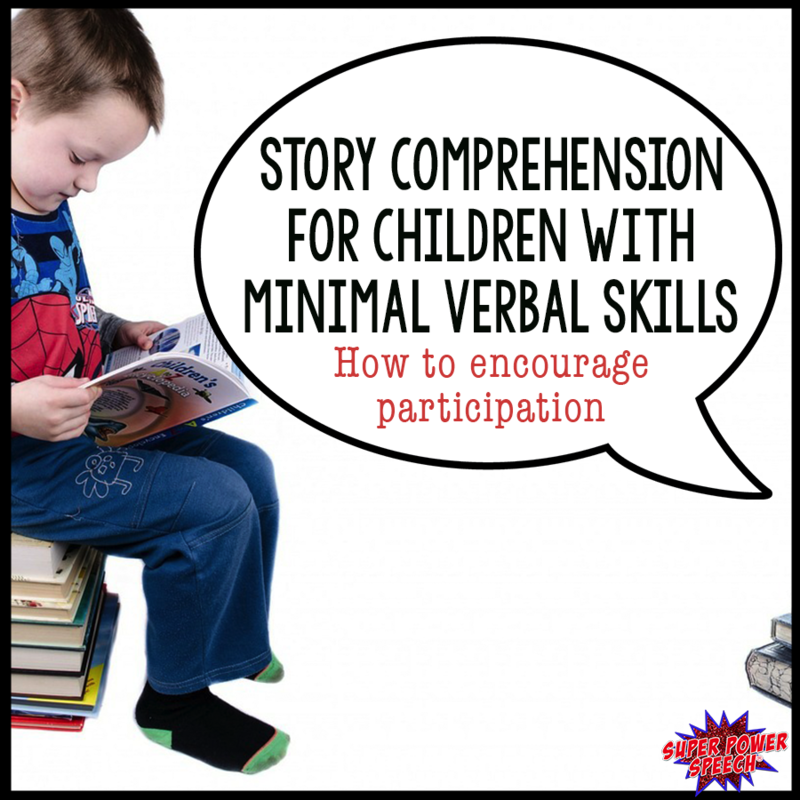 If your student has the motor skills, a GREAT way to work on language comprehension is to use a story scene and characters/items from the book to retell the story! The adult can verbalize what is happening, while the student gets the characters and items and uses them for retelling. 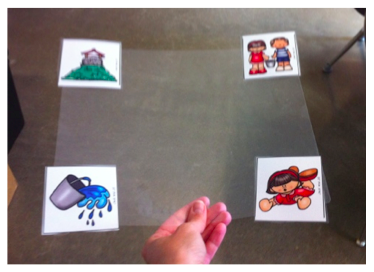 This is the perfect activity for students with apraxia of speech to demonstrate story comprehension! 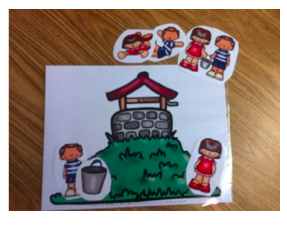 How can I create a picture or manipulative board? I realized that for students that are used to picture exchange and pictures with Velcro, it is quite simple to have a board to answer questions, comment, and request! The adult can determine if the child will be presented with only 1 picture, or up to 4. The adult can also switch the pictures around so that the student must scan for the desired picture. Laminate a sheet of paper with a box in the middle. Place fuzzy Velcro on all corners and in the middle of the box. Cut out and laminate picture cards from the story and distractor pictures. Place spiky Velcro in the middle of the picture cards. Use the board for answering questions about the story or requesting items from the story! How do I work on eye-gaze? This is beautiful. And so easy! I ran a thick laminating sheet through my laminator and added fuzzy Velcro to each corner. It is stiff enough to use for eye gaze and very convenient! Now, it can be used to present from one to four picture choices to an eye-gaze communicator! Do you love these ideas and want to try them out for yourself? Check out my newest product! OMG! I love this post! We have just been discussing something like this with my son! Thank you! Would I be able to use this on a tablet? I have a student with a PRC Eye Gaze device and would love to use this with her. Yes, I use it on a tablet. For my student with eye gaze, I have better results cutting out the picture choices and applying them with Velcro to an eye gaze board. AAC has stymied me forever! Thank you so very much!! !